There were times yesterday that I began to dislike this cake! How can something you have made over and over again, be so awkward? The moral of my story is ‘Do not bake when you are running around like a headless chicken and expect it to turn out perfect’. I’ve said it so many times, I really should listen! Anyway, back to the bake – There was actually nothing wrong with either bake that I made yesterday – I can vouch for this as I ate more than my bodyweight in Swiss Roll yesterday and it was all light and gorgeous. Just not photo worthy. I was leaving the house within the hour to go to choose wedding dresses with my youngest sister and tried to stretch time by popping in a quick Swiss Roll – Now this recipe is quick but not even this one can be finished within 30 mins. We are not the most romantic of households, it has to be said. This may well be the only nod to Valentines Day that we do – There’s plenty of love in our family, but not many hearts and flowers. I actually tagged Dermot into my Facebook status yesterday at the bridal shop, asking if we should do the marriage stuff all over again .. His response?..’Could you be bothered? !’ And they say romance is dead! I piped the hearts and baked for 4 minutes before adding the rest of the mixture. My tip would be to use a Size 2 nozzle and make the heart shaped really defined. Make it look stupidly so – sharps points, the lot. I coloured 4 tbsp of the cake mixture (before adding the chocolate) with RED RED paste food colour. Remove hearts from the oven. Add the grated white chocolate to the remaining cake mix and fold through. Mix the raspberries with the jam and spread evenly on the cake. Add the double cream and roll as tightly as you can. 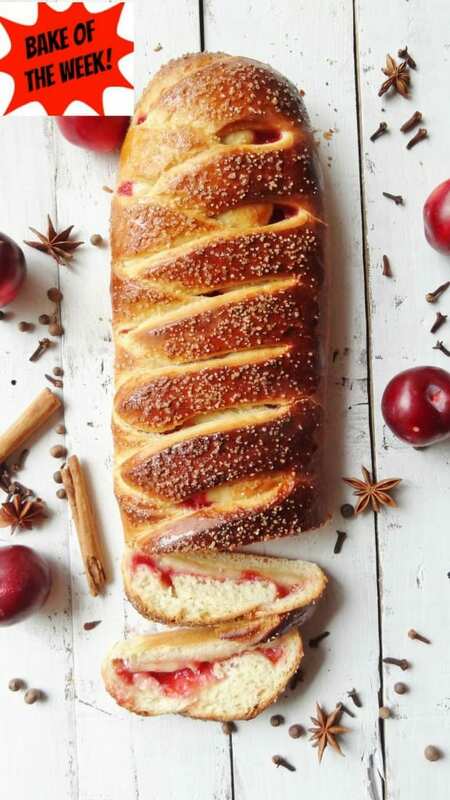 I just love this week’s featured Bake of the Week – Plum & Marzipan Braid from Hannah at Domestic Gothess. 3. Love the thought of these jam muffin donuts from Winnie’s Blog and even better that they are baked not fried. Thanks again to everyone who entered and visited each others – Us bloggers live on feedback(and cake) so we love your comments. Don’t forget to join in with #FoodieFriday this week which I am officially now taking over – No theme and anything foodie is allowed. Open all week, not just Friday! 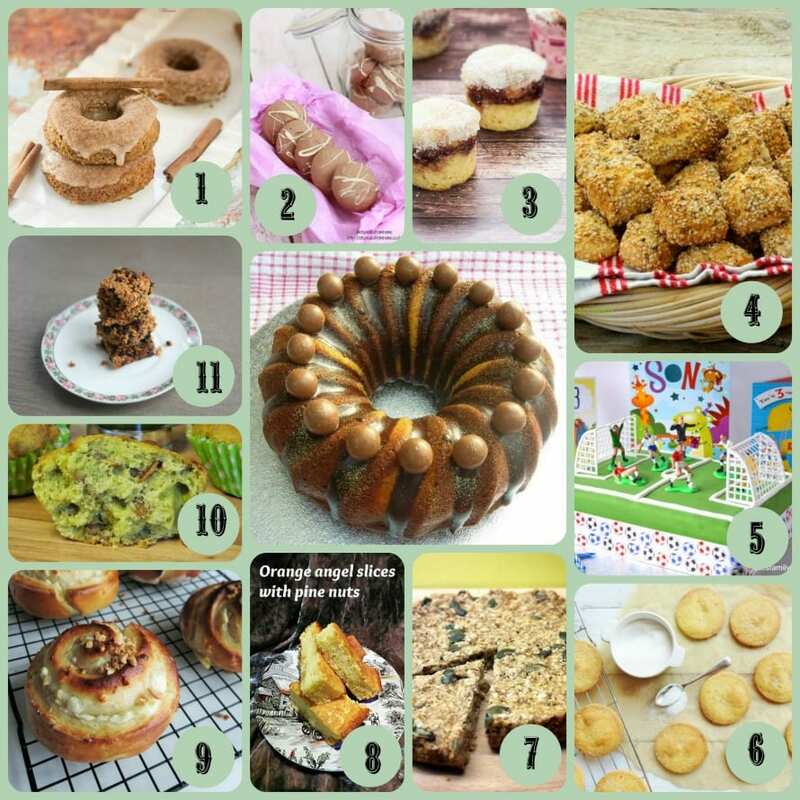 For Bake of the Week entries, all types of bakes are welcome – savoury, sweet, healthy, biscuits, cakes, bread, pies – I share them all on twitter, Pinterest and Google+ and comment on them all. Feel free to join the Pinterest board where there are over 300 entries! 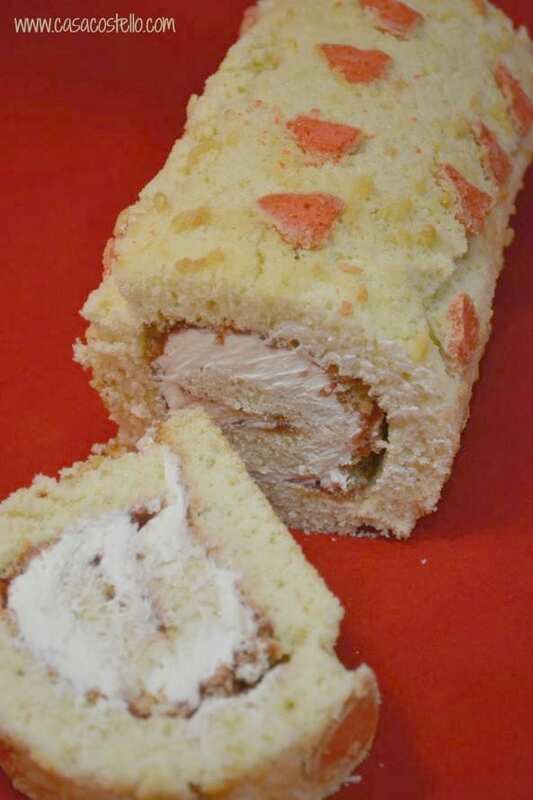 This Swiss Roll is definitely my favorite ever!! To me your Swiss roll looks lush. I bet it tasted wonderful. I cannot even remember when I baked a Swiss roll. Everything looks scrumptious as usual. Your swiss roll is very clever and that plum bread has me wanting to go and bake one straight away. Thanks for the round – up. Great collage. We are a bit like you although this Valentines day we have a night away in London as we are going to a concert (that has nothing to do with valentines Day). Oh my goodness Helen you are amazing! I love the idea of having hearts within the cake…that is just sooooo clever. And the pictures look wonderful, you don’t need to worry about a thing. I am also super impressed and jealous that Chocolate Log Blog managed to turn out a bundt cake looking so incredible. Mine ALWAYS stick!! Beautiful bakes, Helen. I haven’t been baking much as we are still eating Christmas goodies! Lots of inspiration here though. This looks fantastic. I haven’t tried making a swiss roll yet. This looks so yummy! might make one for the OH! Yum! That looks fantastic! 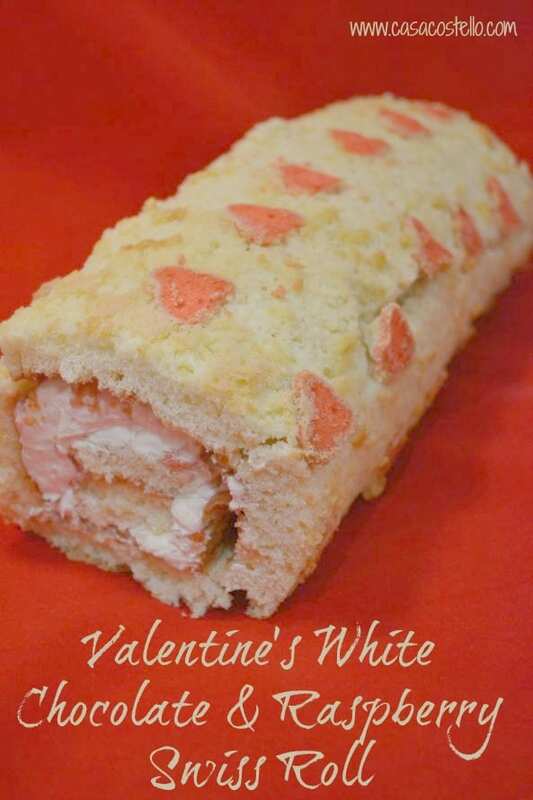 I’ve never made a swiss roll but my husband would LOVE this for Vday! Love your recipe – so beautiful and yummy sounding! I love your valentine swiss roll! I love romantic Valentine treats. All your bakings are lovely and delicious. Wow, lovely Swiss roll. I mostly eat some salty versions of it but this white chocolate-raspberry combination seems perfect for me.